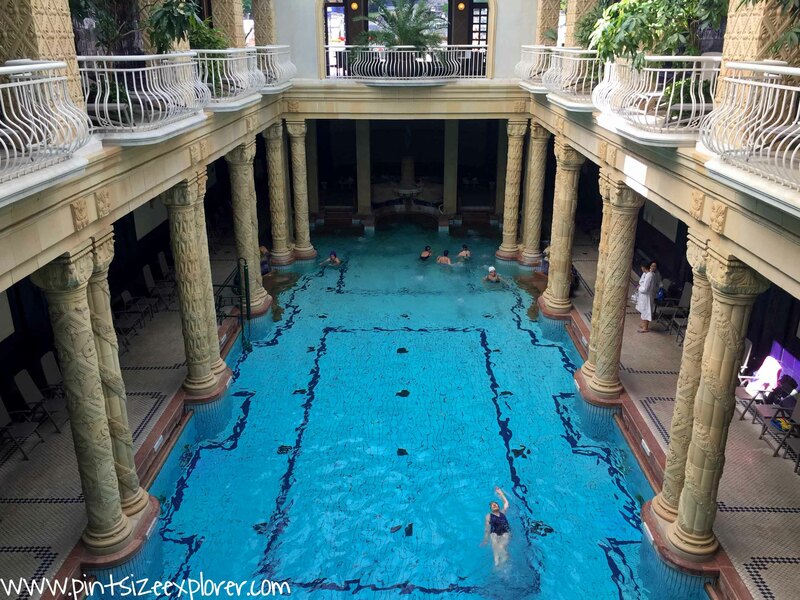 Top on my list of things to do in Budapest, was to visit one of the many thermal baths! 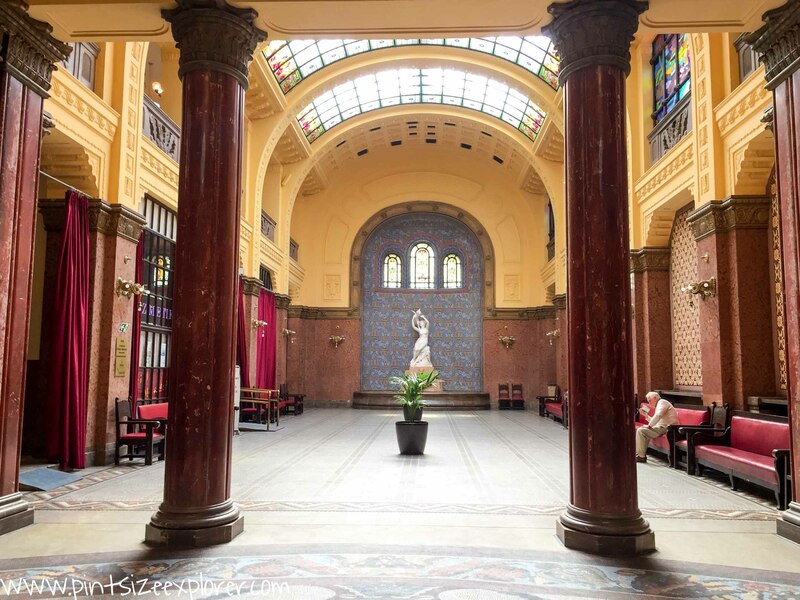 There are actually quite a few different baths in Budapest, but which one should you visit? 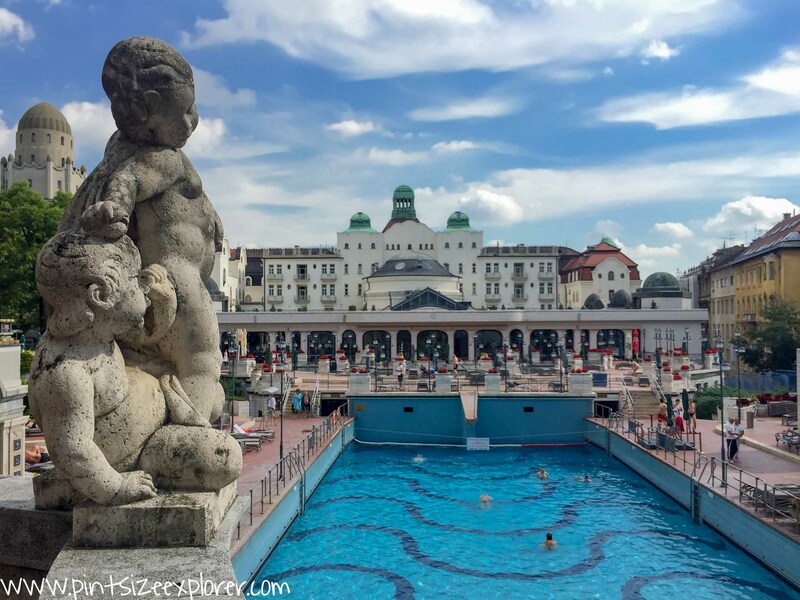 The most popular (and central) baths are The Rudas, Gellert, and Szechenyi Baths. 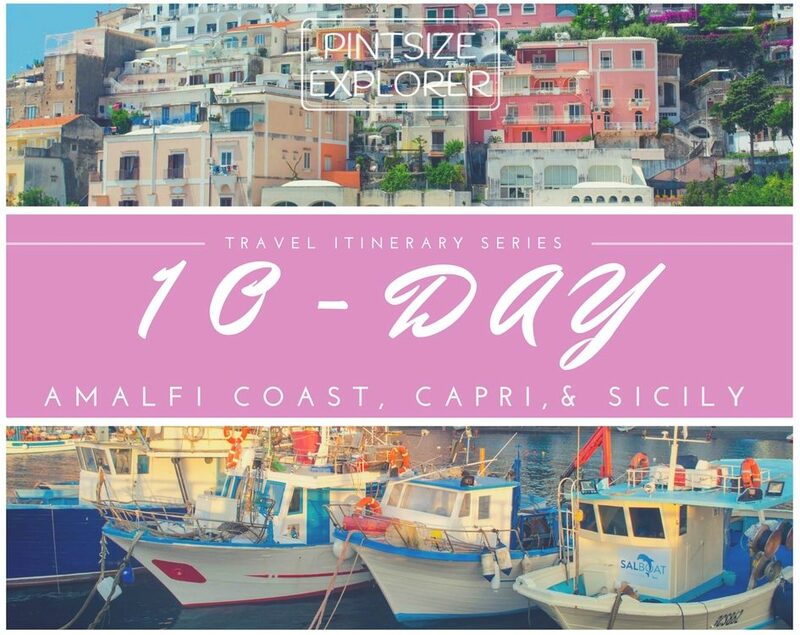 After a little bit of research we figured the deciding factor came down to location, time of the year, and how long you intended on being there. 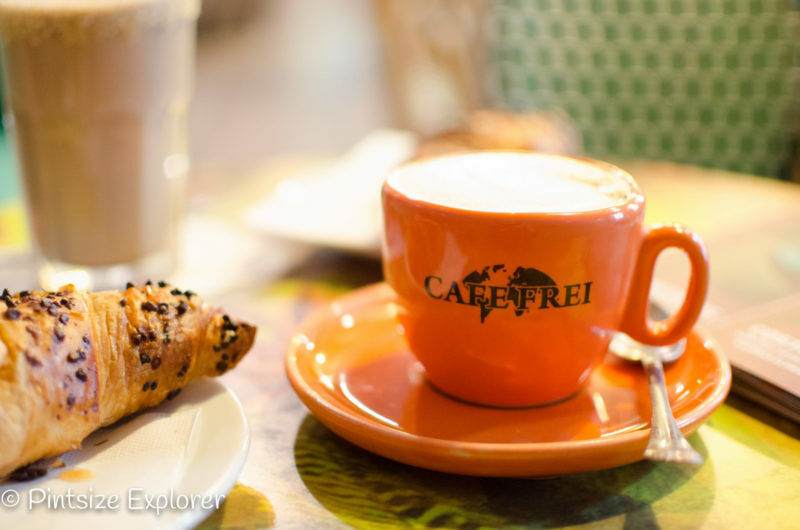 Location – Consider what you might be doing before or after your visit to the baths, as you won’t want to carry around damp items with you all day. 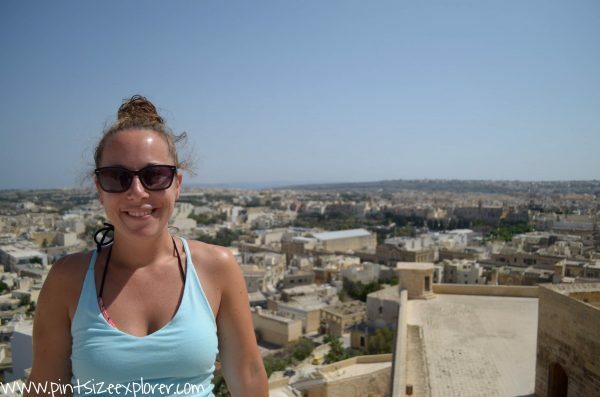 We personally wanted to head back to apartment to get showered there, so choosing a bath that was close by was important to us. Time of the year – Depending what time of the year you are visiting might make a difference to which baths you choose to visit. 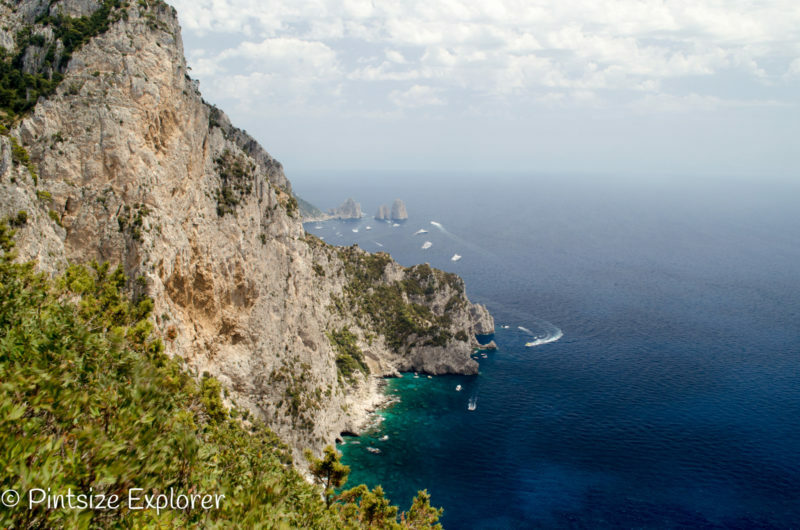 If you are visiting during the summer season (or at least when it isn’t raining! 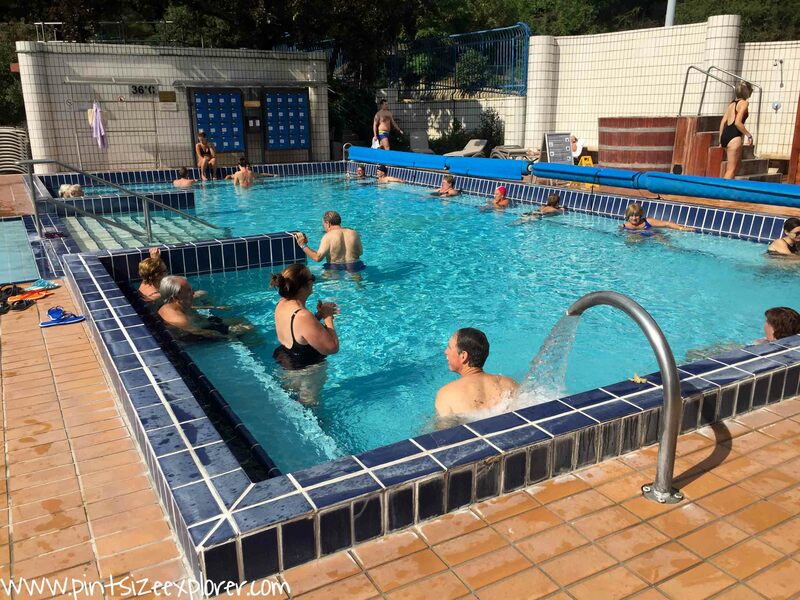 ), then consider one of the baths that has outdoor pools available for use too. How Long – If you intend to make a day of your visit, then choose a bath that has more to offer to keep you busy. Some of the baths offer extra’s, such as treatments and dining. 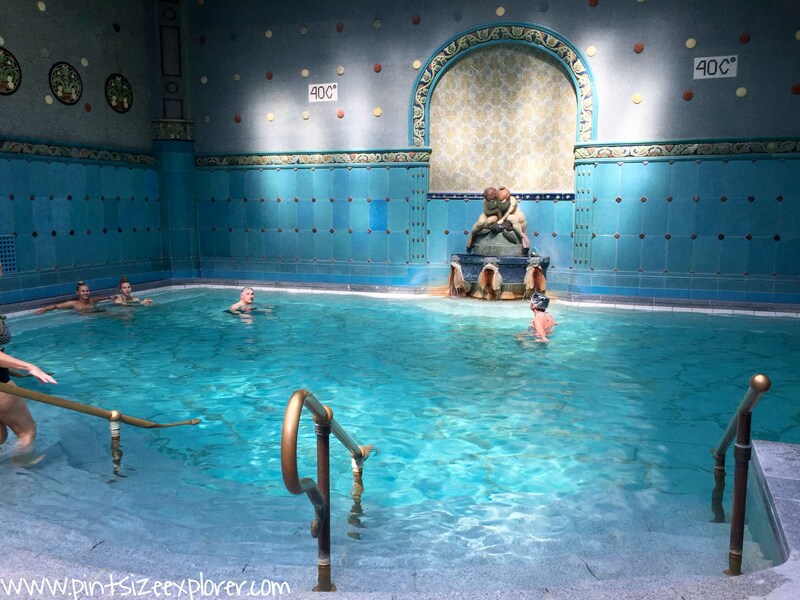 We decided to visit the Gellert, mainly as it was the closest baths to our apartment, but also as it known for being the most beautiful of the city baths. The complex has three areas; (1) the indoor pools consist of four thermal pools, two immersion pools, a sauna and a steam room, (2) the swimming pool area consists of the main swimming pool and a thermal pool, (3) and the outdoor area consists of a large wave pool, a thermal bath, a plunge tub, and another sauna. Geez! The Gellert doesn’t end there! You’ll also find a huge choice of beauty and medical treatments, aqua fitness, a restaurant inside, a small cafe outside, and a large sun terrace. Set in a grand building that is also a hotel, you can purchase your tickets from one of the small ticket booths in the entrance hallway. Tickets can also be pre-booked online by clicking here. There are several ticket options to choose from, and prices will vary depending when you are visiting. 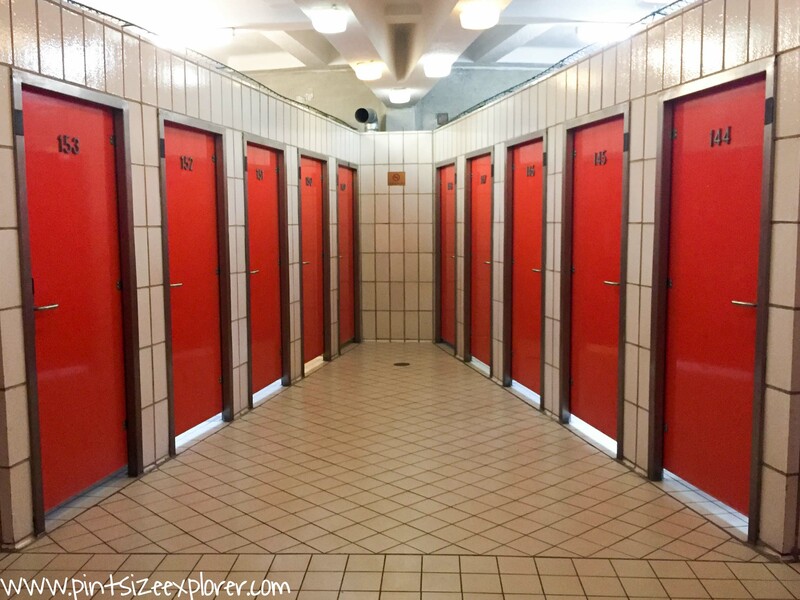 You can also choose between a standard locker or a cabin (private changing room). Prices for optional extras such as massages, manicures and other beauty treatments, can be found here. How Long Do You Need There? Well, this would be personal preference, but I’d imagine most visitors spend between 90 minutes – 3 hours there. 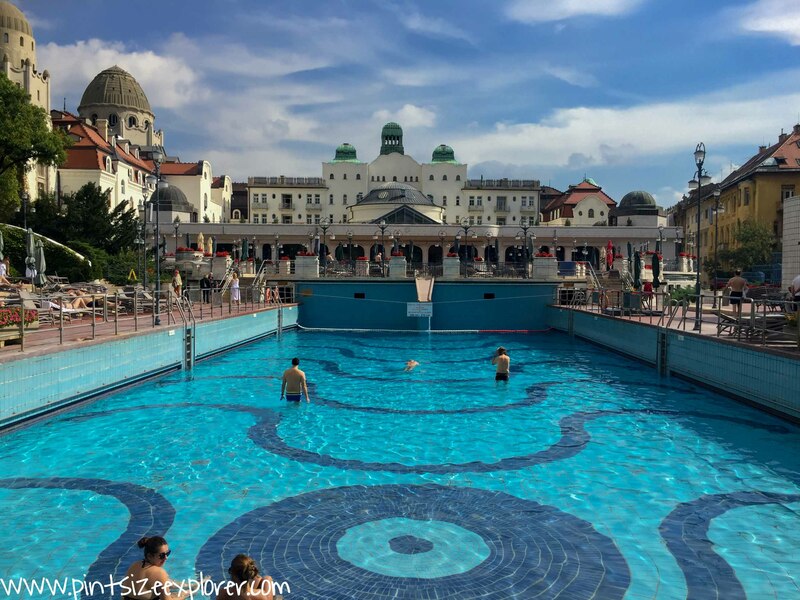 The Gellert has both indoor and outdoor thermal baths, so should you be lucky with the weather, you could easily spend the best part of a day here. 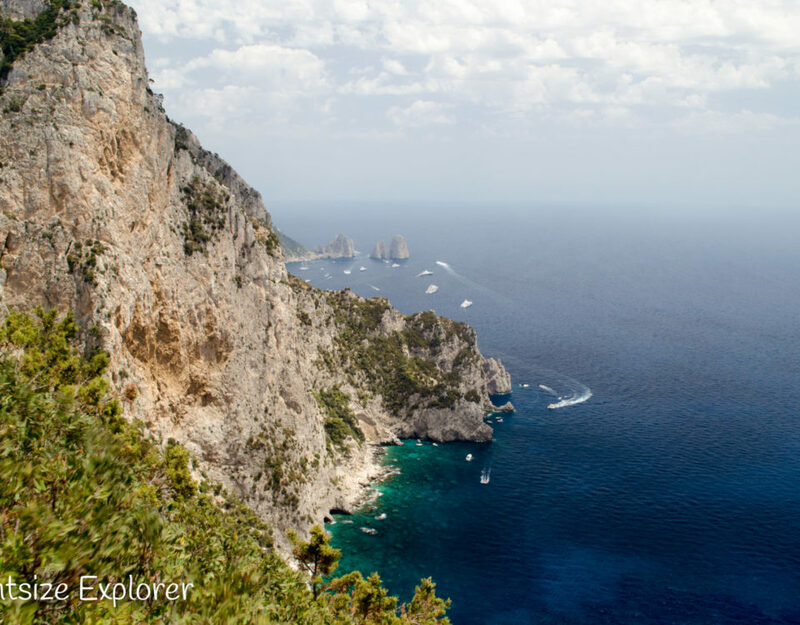 Explore the baths, book in a treatment, grab a spot of lunch, and then relax out in the sunshine. We wrapped up in two hours, without having any treatments or food. 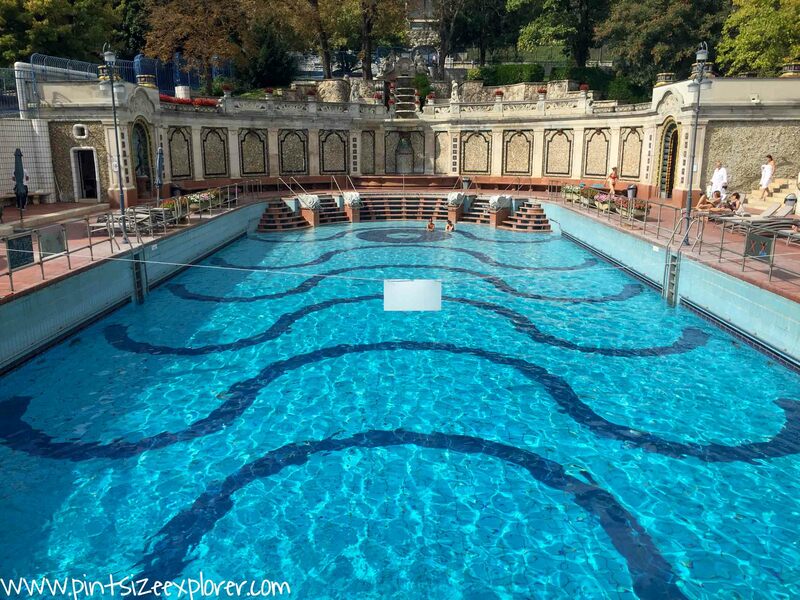 You’d have already noticed just how huge The Gellert is, so don’t be surprised when the inside appears to be like a labyrinth! I’d say my orientation skills are top notch, but even I would have got lost without Adam to direct us through the complex. 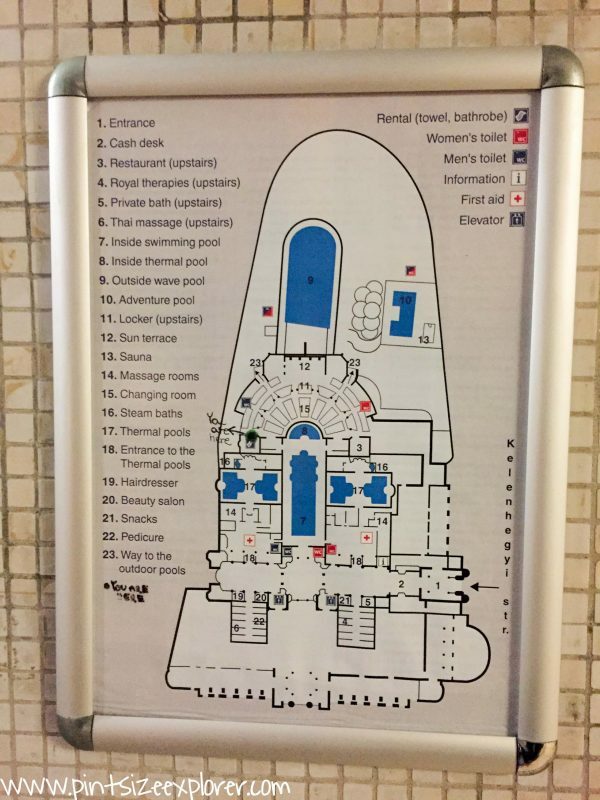 Make sure you take a peep at one of the maps that are displayed on the walls, otherwise you’ll be walking in circles trying to work out where to go. There is one just as you enter the changing areas. 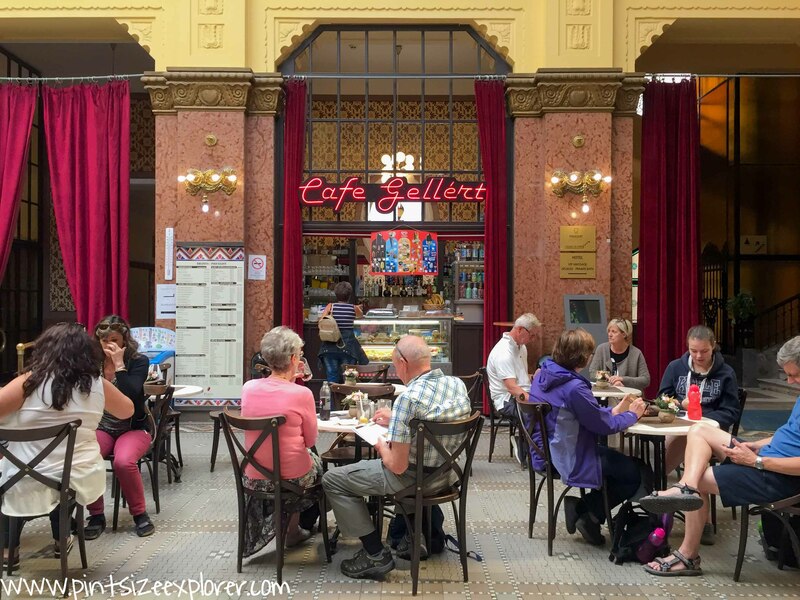 What Does The Gellert Look Like? Don’t expect anything fancy from the changing areas. 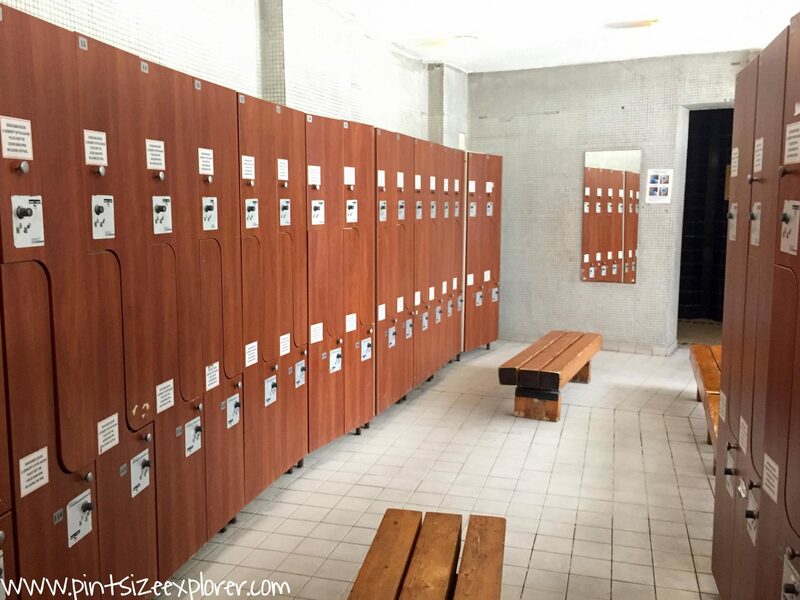 The cabins predominantly take up most of the lower level, with the individual lockers, benches, and a few private cubicles based on the upper level. Let’s have a look inside first! 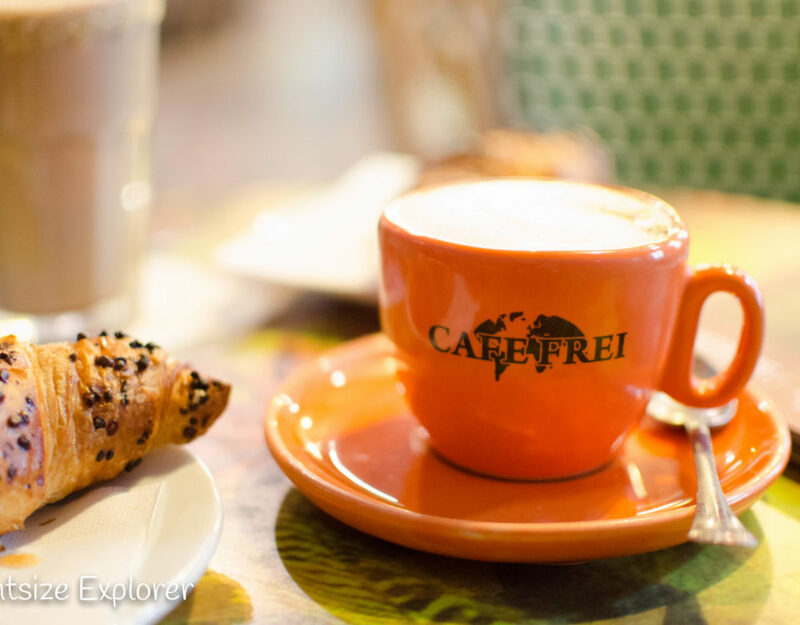 It wasn’t really appropriate to take loads of photos indoors, but I got a few snaps like the ones below. 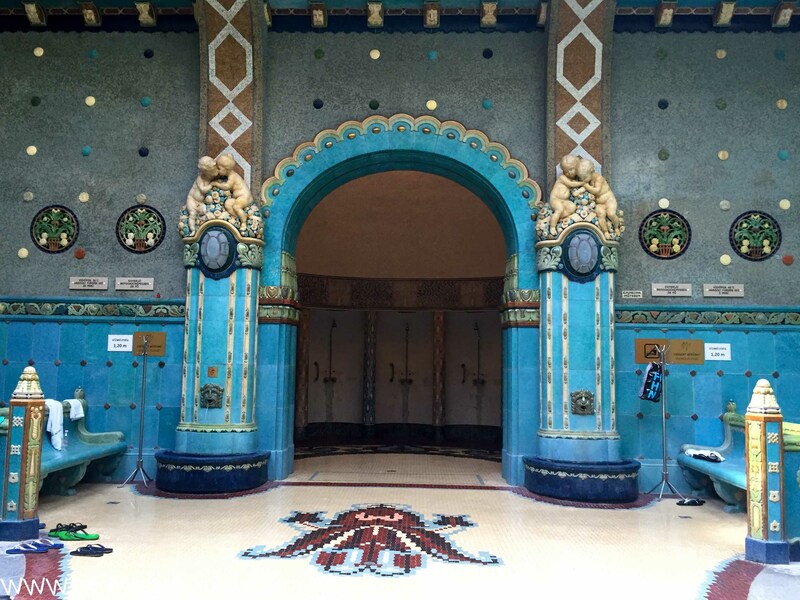 There are four thermal baths, each decorated with beautiful mosaics and intricate art Nouveau detail. Originally, these baths would have been strictly separate for males and females, however mixed sexes are now permitted in all four baths. 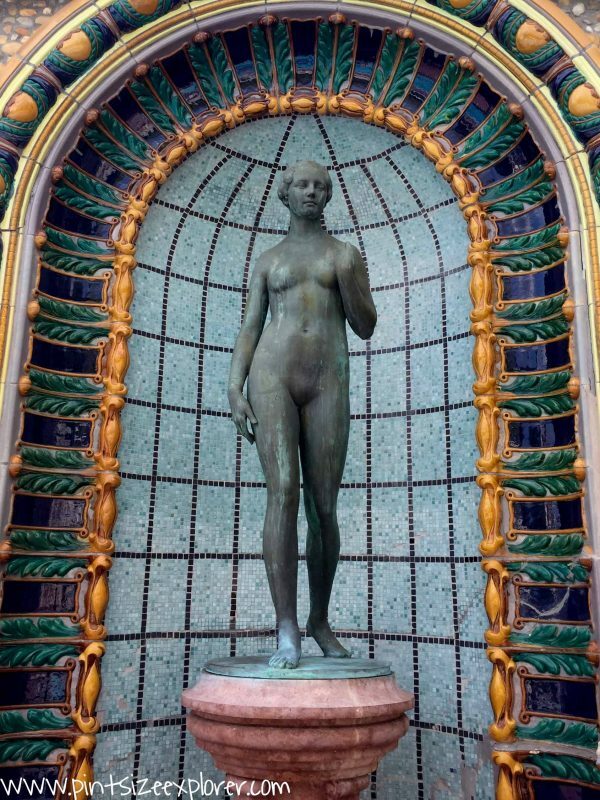 In the centre of the baths you can find The Gellert’s iconic indoor swimming pool, possibly the most photogenic pool I’ve ever seen! 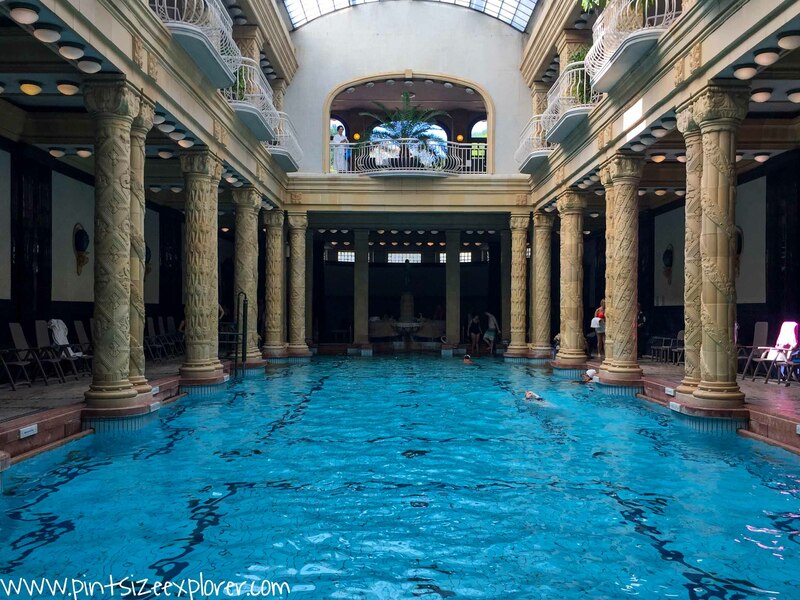 Grand columns line the length of the pool, with lounger chairs on either side to relax on. There was also an upper level (also with lounger chairs) that overlooked the pool. The sheer height of the room added to how grand the room felt. We didn’t have a dip in this pool as for some reason there were only old ladies and a few old gents floating around. Perhaps this pool came with an age restriction of 70 years plus! At one end of the pool an aqua aerobics class was taking place, whilst the rest of the pool was being used for swimming laps. I would love to say it was an old lady thing, however it is compulsory to wear swimming caps in this pool. Caps could be rented, unless you have one to bring with. Does anyone actually own a swimming hat anymore? Now let’s have a look outside! 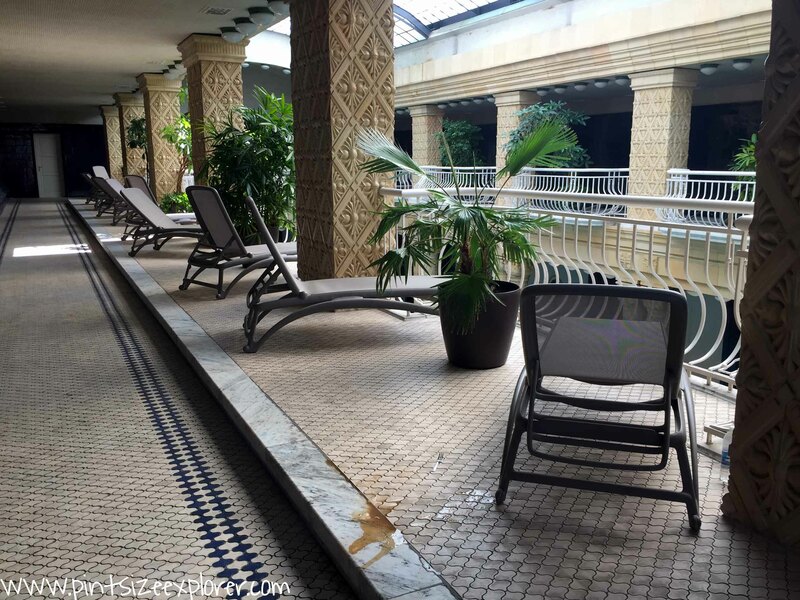 The outside area was definitely my favourite part of the baths! We had a gorgeous day with sunshine, which made our experience that extra bit special. 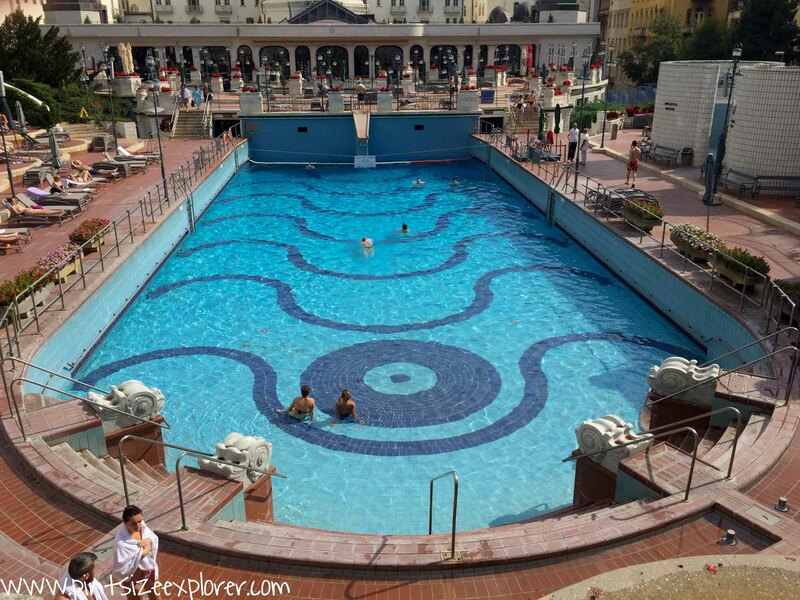 The main feature was the GIANT wave pool which was surrounded by beautifully detailed columns and statues. 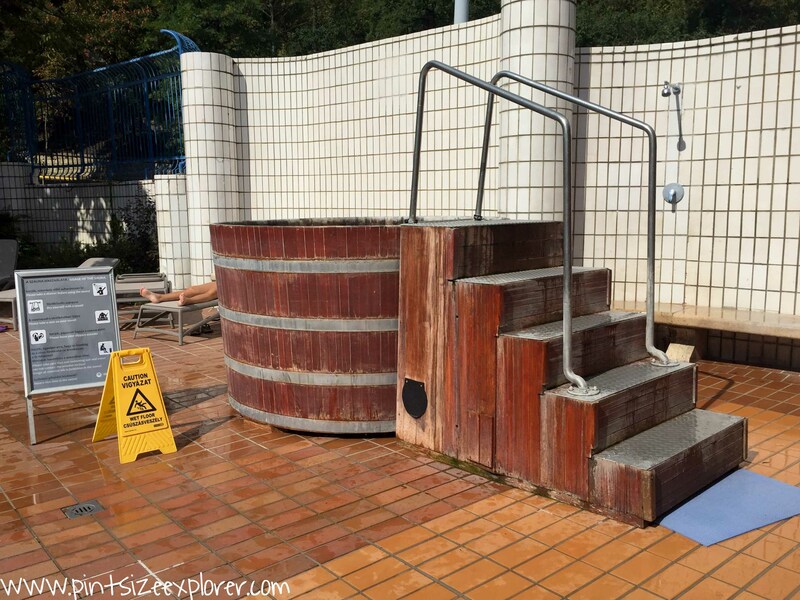 To the side of the wave pool, you’ll find a thermal spa, another sauna, and a funny looking plunge pool in a giant barrel. Side note, the water in there was freezing so I won’t be recommending it to anyone! Behind the wave pool there was a pretty terraced area with tables, chairs and loungers. If you pick a nice day to visit, this would be a good spot to relax in the sunshine away from others. 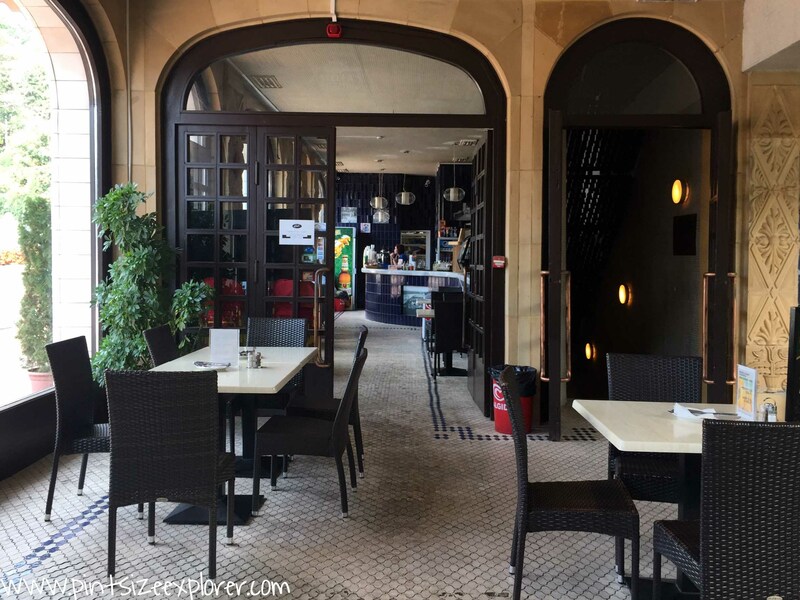 Just inside the terrace, you’ll find the restaurant which is located directly above the main swimming pool, with several of the tables overlooking the pool. 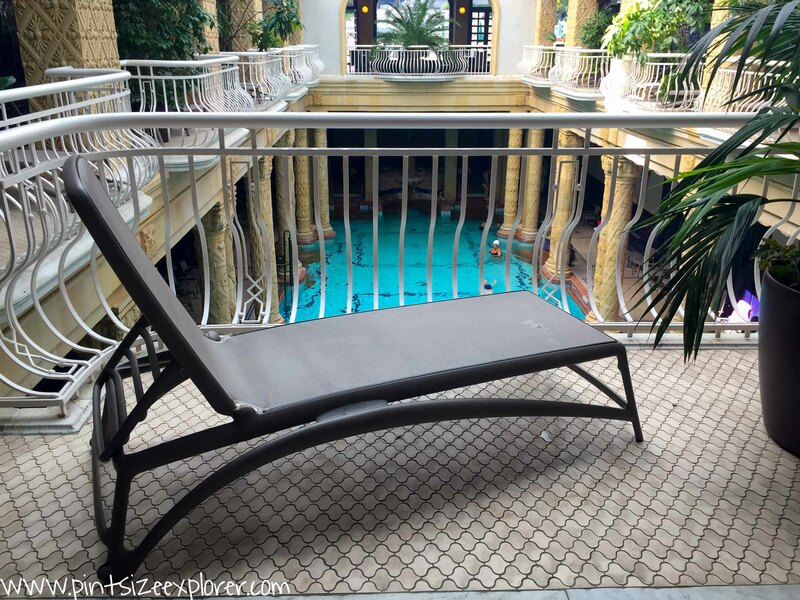 An upper terrace encircles the pool, so there were a few extra loungers there too. Bring your own towels – towels can be rented for an additional cost, but I read they weren’t very absorbent anyway! Bring flip flops – you’ll be walking from the changing areas to both the indoor spas and the outdoor pools, so best to keep your feet covered. Esp if you are hygiene freak! Remember your locker number – wristbands can be used to operate ANY of the lockers, so choose an empty one and remember the number.